Most famous kalimath temple is on renovation now a day. 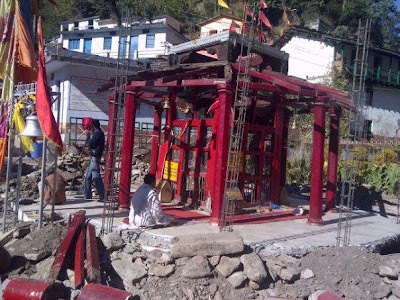 temple renovation work started just few day before under Badrinath-Kedarnath temple committee. as kalimath temple is known for it’s spiritual power. and it’s always opens for all 12 month of year from the morning 5:00 AM to evening 6:00 PM. the temple renovation work starts with it’s out-area. labor keep the middle part of temple as it is before and it’s outer pillar overthrow from there after digging one day. digging work is going in progress and very fast as devotee not getting enough time to worship Maa Kali. but worship is continuing in the small part of internal part of temple.